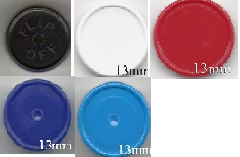 13 mm, Snap Off Type Vial Caps. Plastic tops snap off to reveal aluminum seal with hole. Available in Red, White, Blue, Yellow, Green, Black, and Hot Pink.